Add another .com enterprise to get aboard the Twitter train of social media. 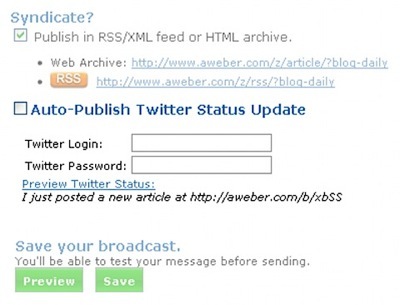 Aweber, the popular newsletter delivery service, has now enabled the option to send out your newsletters to Twitter followers. Earlier last week the company announced you can now send an update to your Twitter account when you send a new broadcast/newsletter. Just another example of how Twitter is taking over the world. I absolutely love Twitter. It’s a great way to meet people that you may miss at shows, and a good way to keep in touch!